When H.Moser & Cie released the first Swiss Alp watch it was a flashpoint for discussions about the brand. As a bit of marketing, it was ingenious, but over the last couple of years they have shown that it was not a one-off horological talking point, but a very real basis for a new case family. Although not the (now almost expected) SIHH ‘marketing piece’ this year, the most interesting watch released by Moser at the fair (and arguably in the top pieces of the fair in general) was the Watch Concept Black Minute Repeater, which combines the Swiss Alp case with the stark minimalism of the brand-less but nonetheless immediately identifiable, Concept pieces. With the new ‘bonus’ of having no hands and relying on a minute repeater, and a one-minute flying tourbillon with a skeletonised bridge as the single visual focal point on the glossy black dial. Functionally, the hours and minutes are on demand, with the minute repeater chiming the hour, quarter, and minutes. Only with this watch, you don’t have a usage back up of a watch face. The time setting is still via the crown, but it requires a little explanation. Once you activate the minute repeater via the slide on the side of the case, you know what the current time is. You can then change the time by pulling out the crown, which reveals a series of a dozen marks/ graduations. Each of these represents five minutes, so turning a full circle of twelve will move the time forward by an hour, and progressing one graduation will put the time forward five minutes. Powering this inside the platinum 45.8mm x 39.8mm case is the manual-wind Calibre HMC 901, Moser’s thirteenth movement since 2005. Shaped to the case, and with the two repeater gongs and resonance chamber having to be reworked for this unusual case shape, it was made in conjunction with MHC Manufactures Hautes Complications SA. With Moser striping on the late and bridges on the hand finished and deocrated movement, it beats at 21,600VPH, it has a power reserve of eighty-seven hours. 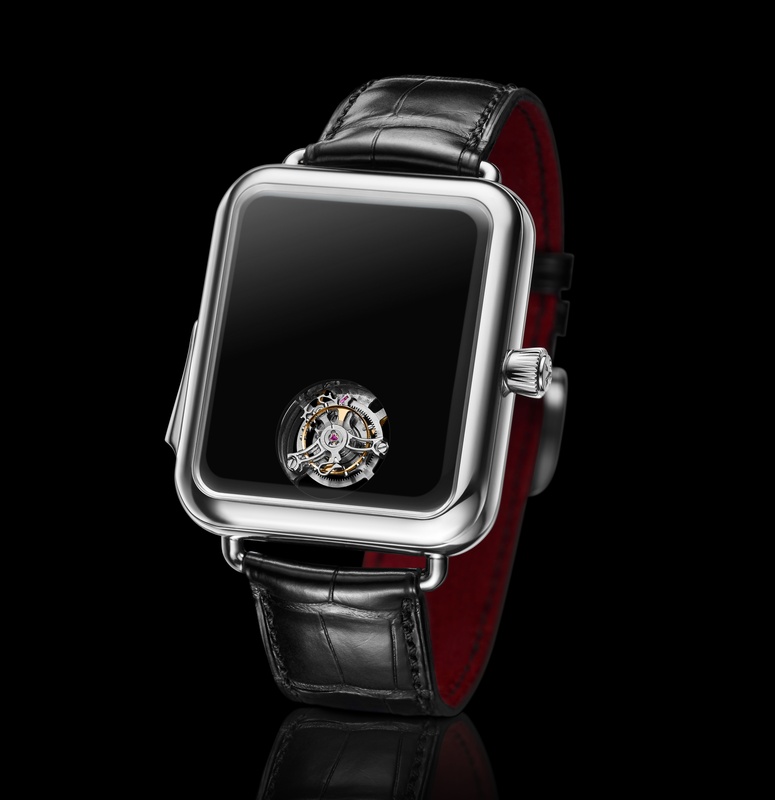 It comes on a black alligator strap with red lining and a platinum pin buckle engraved with the Moser logo. Although we are now accustomed to the Swiss Alp case, the continuation of the pieces’ ‘clash’ of traditional watchmaking with the smart watch style exterior still manages to not just grab people’s attentions, but also be interesting and unexpected.